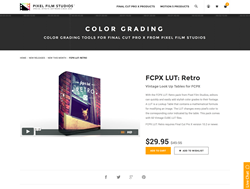 "FCPX LUT Retro will add a vintage washed look to any and all media put inside of FCPX enabling editors to get different color graded looks every time," said Christina Austin - CEO of Pixel Film Studios. A LUT is a Look Up Table that contains a mathematical formula for modifying an image. The LUT changes every pixel’s color to the corresponding color indicated by the table. By manipulating each pixel, LUT’s can change each color range differently, giving the user more control over any look. 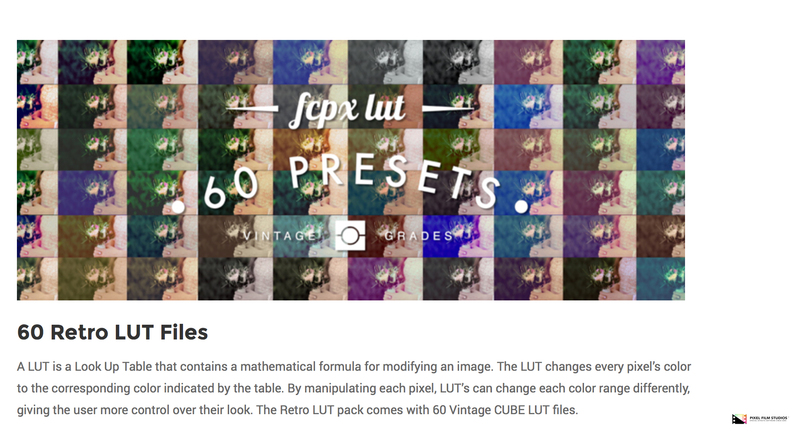 The Retro LUT pack comes with 60 Vintage CUBE LUT files. Exclusively for Final Cut Pro X. 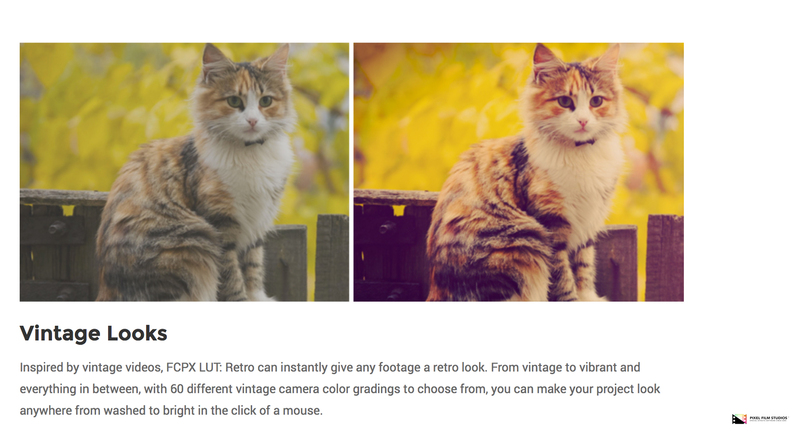 Inspired by vintage videos, FCPX LUT Retro can instantly give any footage a retro look. From vintage to vibrant and everything in between, with 60 different vintage camera color gradings to choose from, users can make a project look anywhere from washed to bright in the click of a mouse. CUBE LUT files are extremely versatile. They can be used in many different softwares. 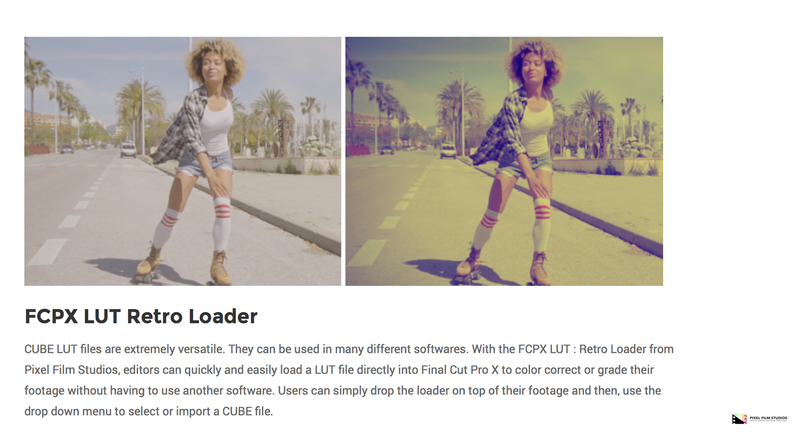 With the FCPX LUT Retro Loader from Pixel Film Studios, editors can quickly and easily load a LUT file directly into Final Cut Pro X to color correct or grade footage without having to use another software. Users can simply drop the loader onto footage and then use the drop down menu to select or import a CUBE file. 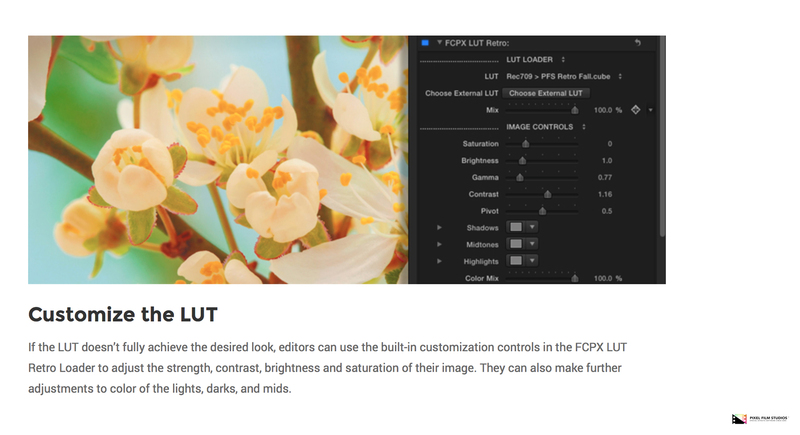 If the LUT doesn’t fully achieve the desired look, editors can use the built-in customization controls in the FCPX LUT Retro Loader to adjust the strength, contrast, brightness and saturation of their image. Users can also make further adjustments to color of the lights, darks, and mids.